Remarkably, I made it more than halfway through my university education debt-free. It was a point of pride: I worked hard, I saved a lot, I earned scholarships and I was fortunate to have parents who financially supported me. But shortly before my third year, the game changed completely in just a four-month period. In 2006, I decided that I wanted to volunteer overseas, so I spent the summer in Vanuatu building a school. I have no regrets--it was an amazing experience and played a formative role in my career to date--but it was also very expensive. Following Vanuatu, I spent an extended layover in Australia. In a three-week period I managed to travel from Sydney to Cairns and back again. I did it all: the Blue Mountains, Fraser Island, the Whitsundays and a week in Byron Bay. (For anyone who has done the Australia backpacking thing, you'll understand what a feat this was to accomplish in such a short time frame.) Again, it was well worth it, but it was also very expensive. The cost of travelling itself wasn't necessarily the problem; I had fundraised and saved for a year in advance. Rather, the problem was that because I was in overseas, there was a three-month period where I had no income and no way to save for tuition. Finally, although I had completed 3.5 years of school, I was only two years into my journalism degree. This meant that with two years left to go, the education fund my parents had generously created for me had depleted prematurely. For the first time ever, I applied for student loans and maxed out my student line of credit. I tried to assure myself that it would be okay. And it was. Sort of. Throughout my third year of university, I valiantly tried to eradicate the debt I had suddenly accumulated. I wanted my debt-free bragging rights back. In addition to my job at the university, I took on a second job and then a third. So there I was, in school full-time, with three part-time jobs on the go. It was a solid plan, until my health began to decline. I could barely make it to class for six weeks, let alone to work. The debt was here to stay. The summer before my forth year, I saved enough money to pay my tuition in full. Again, with the help of my parents, I didn't have to take out additional student loans. And this time, I was a little more sensible--rather than struggle to maintain my multiple part-time jobs, I just had one. School became my priority. Since 2006, my debt has hovered around $10,000. (Note: This does not include an undisclosed but substantial chunk of change that I owe my Dad for his assistance in South Pacific adventure.) Sometimes it's a bit more, sometimes it's a bit less. But it's always around $10,000. (Not surprisingly, $10,000 is around how much I spent in Australia and Vanuatu combined. I'm confident that had I not volunteered overseas, I would not be in debt today.) This wouldn't be such a terrible admission, except for this final act of divulgence: I have no savings. None. So basically, I'm $10,000 the hole and have no assets. For the last three years, I've been in a constant cycle of attempting to pay off my debt too quickly, not having enough money left for spending, dipping into savings to cover the difference and subsequently getting further into debt. It's a nightmare that I've created for myself. And then, last August, I was laid-off. Any budgets or debt repayment plans I had created were suddenly useless. I applied for interest relief on my student loans, but that still left me with three credit cards and a line of credit. Before the haters start in on me, I'd like to clarify that since my lay-off there has only been one month where I haven't been employed, either through a part-time job, a freelance contract or a contract employer. However, my income isn't yet consistent enough to create a solid debt repayment plan. So why don't I get a regular guaranteed-income job? A couple of years ago, when my brother was on EI, he explained to me that he received more in government support than he would make at a reasonable minimum wage job. Instead, it would be more profitable in the long-run to spend the time working on his portfolio. At the time his argument didn't make any sense to me. But now that I'm in that exact position (that being the position of someone who previously talked down about people who "worked the system" but am now "working the system") I completely understand. Every day, I scour job banks looking for part-time employment that will allow me sufficient income to continue working on my portfolio and my freelance career. Sometimes I apply. Sometimes I go to interviews. But every time, I realize that minimum wage or similar is just not enough. And unfortunately, with upcoming contracts and travel plans, applying for full-time positions isn't an option. 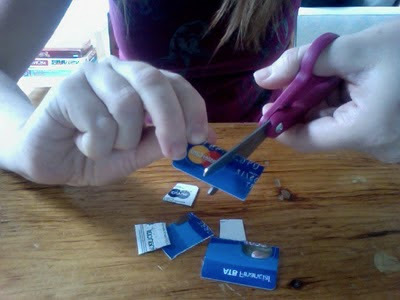 I feel imprisoned by my debt. . .if only there was a "get out of debt free" card. In April and May, I'll move into Phase 2 of Year of the Deal: tracking my overall spending and creating a budget. To start with, you shouldn't be so hard on yourself. You've traveled and have gained experiences that will live within you for the rest of your life. You also have a realatively low amount of student debt. This is coming from someone one hasn't been as fortunate as someone as yourself....not that I'm complaining because i have it pretty good. I had $24,000 of student loans leaving uni and haven't done any traveling. I rent and don't own my own place. I do have a car and a finance plan to support it for 5 years. I to have worked hard in part time jobs and even to this day work 2 jobs and put in 14 hour days on a regular basis. So to everyone out there, remember that we all have debts and though we need to be resposible, don't let it get in the way of life experiences. I regret not traveling right out of uni. It's just money and we only live once.! what 10,000 is really not so bad. I think I will owe close to 30,000 by the time I get out.....and I will just have a fine arts degree. ouch. In other news I am moving in two months and I am going to Florence for school next year....and I need your resume skills in applying for a job in Florence.